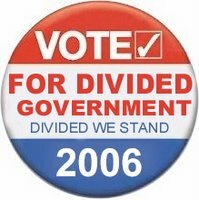 The Dividist Papers: Fifty - Fifty ... as divided as it gets. Fifty - Fifty ... as divided as it gets. "Beats the hell out of me." That was my answer to my question in my last post about what will happen on election day. Pathetic. I've embarrassed myself and this blog. I apologize to all readers for that limp response, and I will rectify that right now with a firm prediction. So, unless there is major information that is unknown today, and is revealed in the next five days, the Republicans will control the Senate and the Democrats will control of the house. And therein lies the problem. As we learned from Ken Fisher, the betting contracts are predicting an unprecedented outcome. An outcome that has not happened in 100 years and never happened since the 17th amendment provided for direct election of Senators - the House changing hands, when the Senate does not. It is a puzzlement. A mystery worthy, perhaps, of the greatest detective the world has ever known. "When you've eliminated every hypothesis but one, then the remaining hypothesis must be true, however improbable." Now that we know the answer, how do we get there? Two scenarios. Democrats hold NJ, and take PA, RI, OH, MT, VA (or MO). This scenario assumes that Joe Lieberman continues to caucus with the Democrats, final tally 50-50. .
Democrats hold NJ, and take PA, RI, OH, MT, VA and MO, for a count of 51-49 in favor of the Democrats, but then Lieberman takes a plum committee, agrees to caucus with Republicans, and again we have a final tally of 50-50. In either scenario, it is great to be Joe Lieberman. That is my prediction and I'm sticking to it. Actually, I kind of like it.